Ajo artist Jacqueline Andes started a weekly sketch class to help regain skills she felt she’d lost. “This drawing is a break-through for me. All the years of teaching and driving back and forth from Phoenix to Ajo, left no time for doing my own artwork.” says Jackie. “After retirement in 2009, I struggled with getting back in the groove. That struggle was emotionally painful, frustrating, and depressing! Artists at all levels are invited to join the weekly class. Check the Calendar for dates. 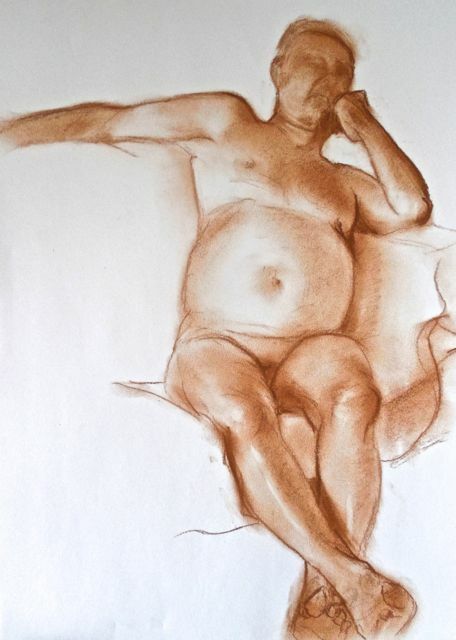 The Sketch Class, started a year ago by Jacqueline Andes, continues to offer weekly sessions for artists who want to hone their drawing skills using live models. The class meets every Wednesday, from 3 to 5 pm in Room 2 at the Curley School Conference Center (in the Courtyard). Check the Calendar for dates. 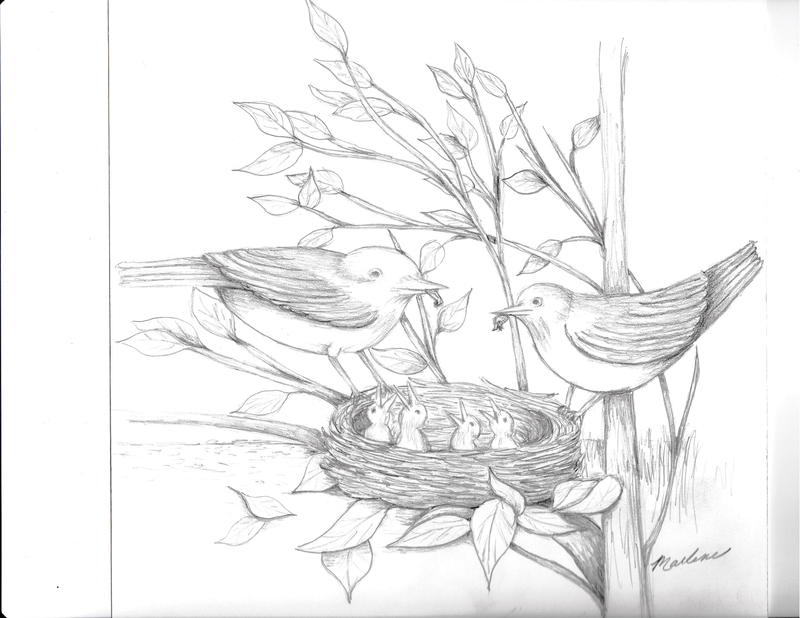 Thanks to Marlene Dixon who submitted this pencil sketch as part of the “family” theme for the April challenge. Lots of feathered critters are looking to nest near us — robins (who are shaking snow off their wings in our yard), Canada geese, mallards and assorted other waterfowl who are cruising the sloughs and ponds, and along the fence line bluebirds are checking out the wooden houses nailed to the posts. Love this time of year. Thanks for capturing part of the excitement, Marlene! The weekly sketch class continues to meet and work on drawing techniques. Jackie Andes, who initiated the classes, says: “The class is two hours. The first 20 minutes the model changes the pose every minute. This is to “loosen up” the hand/eye coordination. “Then there are two 15/20 minute poses, and the last pose is one hour. Most of the artists are using graphite, charcoal, or conte. This last session Marilyn used water color and Seona did a reverse drawing that looked like a black and white photo negative — interesting approach. 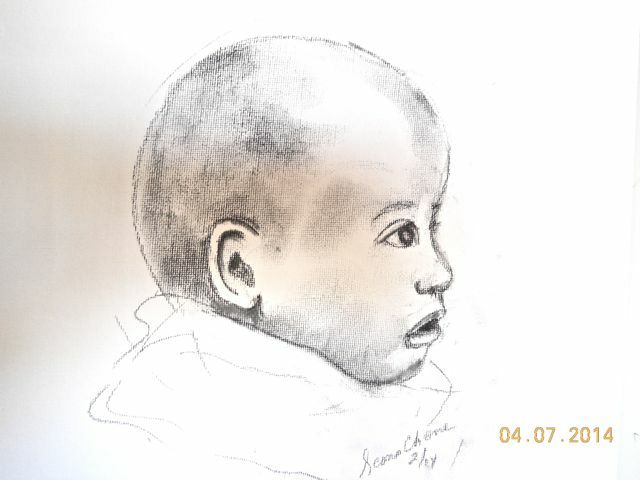 Jackie worked in soft charcoal using a kneaded eraser to create highlights on the form. All of the models have been wonderful and showed great appreciation for everyone’s efforts. “The class is open to everyone at any level in their art education. There is no teacher on hand, which sometimes makes a novice more relaxed. We do share one piece at the end of the session and offer personal reactions — all statements have been very supportive. The next class is Wednesday January 15 at 3 pm. The idea for a sketch class is a hit with many Ajo artists. 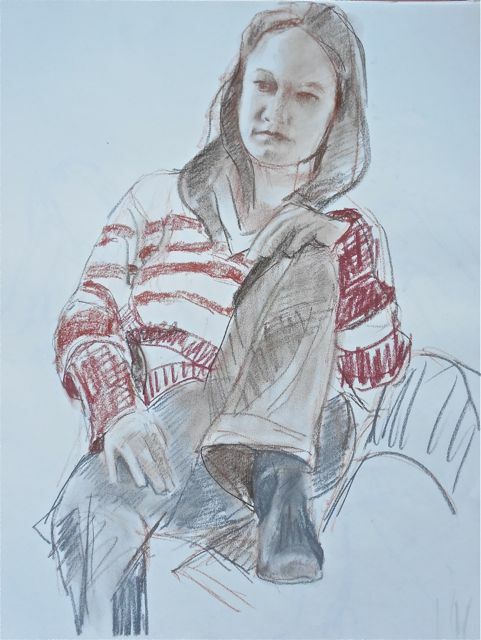 The group meets each Wednesday for 2 hours to hone their drawing skills using models. The next gathering is this Wednesday. The group will take a break for the holidays and reconvene January 8th, same time, same place. Jacqueline Andes completed this piece at the first class.